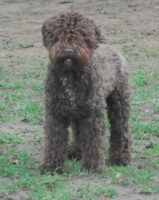 Illico Presto de la Forêt des Hauts de Galgals – Mark Wouters – Lagotto Romagnolo Wasserhunde Deutschland e.V. DNA identified. Admitted to LOSH breeding. Storage disease free. Furnishing free. 24/09/2016: Show German Lagottoclub, Domenico di Matteo Itr). Excellent 1 Champion class males. resCAC. Best coat in show. Excellent 1 chmapion class males. CAC. CACIB. Best male. BOS. Excellent 1 Champion Class males. Excellent 1 open class males, CAC. Excellent 1 open class males, CAC, CACIB, BOS. Excellent 1 open class males, CAC, RCACIB. 6/06/2015:  Show of the Dutch Lagotto Club in Venlo (D), Agneta Pamp (S). Excellent 1 on 4 intermediate class males. 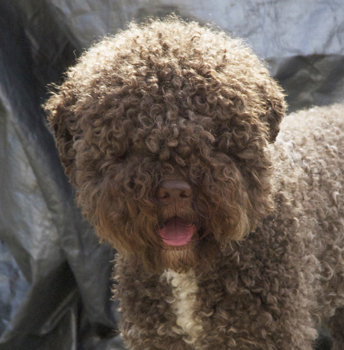 5/06/2015: Show of the German Lagotto Club in Grefrath-Oedt (D), Alessandro Zeppi (It).. Excellent 2 sur 3 intermediate class males. Excellent 1 intermediate female, CAC, CACIB, BOB, Crufts Qualification. Excellent 1 in junior class males, Luxemburg junior champion, bets male and BOB. Excellent 1 in junior class males and Benelux Junior Winner. Excellent 1 in junior class males and best junior. 11/10/2014:  CACIB Charleroi (Be) A. Cuccilato (It). 21/09/2014:  CAC Libramont (Be) Ionescu (Ro). Very promising 2 (on 2) puppy class males. 22/06/2014:  Dutch Clubmatch (Nl) Morsiani (It) 80 Lagotti. Very promising 1 (on 7) puppy class males. Very promising 1 puppy class males.